In the great green room there was a telephone and a red balloon and a picture of… Sweetie, what do you think they’ll say next? Can you make a prediction? If you look at the illustration, they give some great hints– what pictures do you see? Oooh, a COW? Yes, I think they might talk about a cow… or maybe some bears! Let’s see! The cow jumping over the moon and there were three little bears sitting on chairs. Look at that! Cows and bears! Just like we had predicted! It’s a simple enough text, but every night, I found myself delving into various reading strategies with my infant, making connections to other books we’d read, encouraging her to make predictions on what would happen next, or posing questions as we made our way through the pages. I couldn’t help it. Reading strategies ran through my veins, and reading out loud without teaching them felt stiff and awkward. Isn’t he nice? 😀 I mean he could have laughed and reminded me that most 10-day old babies don’t appreciate doing guided reading every day, but instead he was encouraging and excited that our little daughter would have a teacher mommy to help her think well while reading. And the more I thought about it, the more I was sure this was something that needed to be shared. 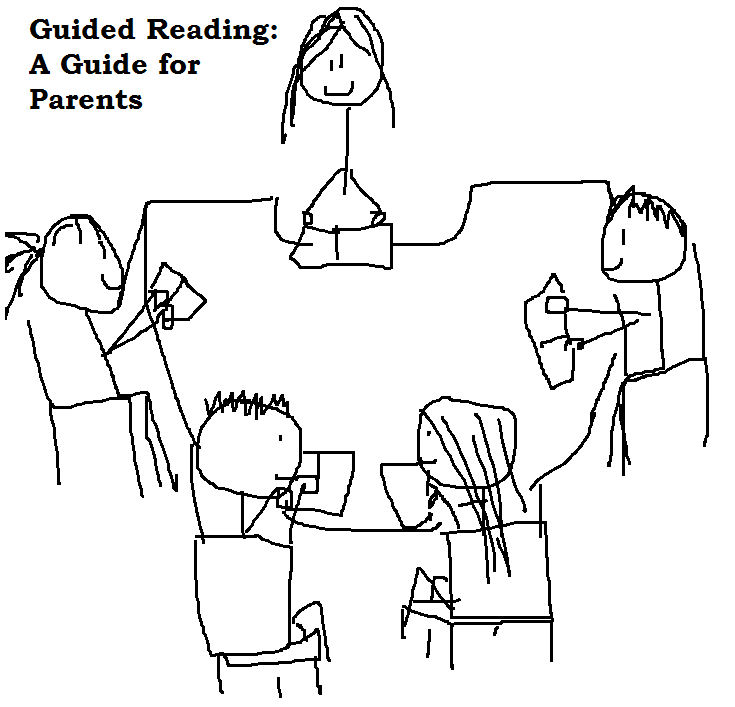 After all, twice a year at parent conferences, I found myself wishing parents could just sit down and do guided reading with their kids the way I did. Johnny was “approaching grade level standards,” and I made sure to work in small reading groups with him twice a week for 20 minutes each time, but MAN, if his parents could sit down with him every day for twenty minutes one-on-one and do the same thing with him, I know he would make TREMENDOUS progress. So here is my mini training program for you, parents! Not just one post, but a whole series. Teachers, please feel free to share this as a resource for your parents! 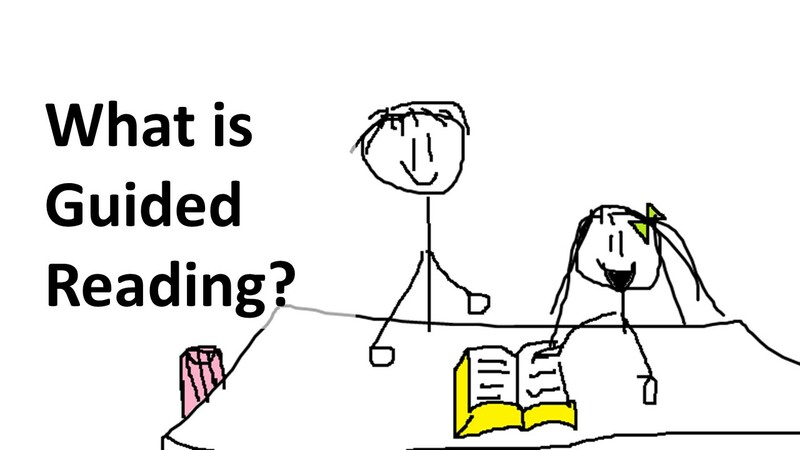 I certainly can’t cover everything about guided reading that teachers know and do, but I’ll do my best to give you the basic tools to up your reading game with your child. Hopefully you will find that this makes your reading time together more enjoyable and more beneficial for your growing reader! Many children may already subconsciously have these thoughts, and our job is to help them bring the thoughts to the surface and talk about them. However, some kids don’t think about these things at all, in which case it is important to help them start thinking more about the text as they read. It is these kids that usually struggle a lot with reading comprehension. They may be able to read out loud decently, but they find little to no enjoyment from it because they don’t really understand what they are reading. These are the children who need the most support through guided reading. Sometimes, I’ll come across a student who can decode and read the text beautifully, but can’t really tell me much about the text afterward. They seem to have forgotten much of the detail, get details mixed up, and/or seem unable to answer deeper questions. In short, they have decent reading fluency but poor reading comprehension. These cases are the most alarming because on the surface it may appear that the child is progressing appropriately, when really they are falling far behind. Another big point I make when teaching reading is this: Good readers remember what they read. If a child reads through a text but can’t remember much of what it said, what was the point? By teaching reading strategies, or “ways good readers think,” students are able to make more meaning from the text and ultimately remember more. One of the best ways to do this is to model the process for them by reading out loud and articulating your thoughts as a reader to the child while they observe. But JoEllen, you say, what kind of thoughts and strategies am I supposed to talk about? Why, I’m so glad you asked! What kind of reading strategies should we focus on? I chose those since they are they were the main clusters we focused on with the reading program at my last school. We actually used a combination of materials, including some units written up by a reading specialist in our district and also material from The Comprehension Toolkit . There are cute printouts you can find online (especially on Pinterest) that may name or lump the reading strategy clusters differently, but most of the key reading strategies for the elementary years will fit under one of these categories. These ways of thinking don’t seem to get as much of a spotlight in the elementary years, but I find these are especially good for strong readers who are ready to think at the next level. How do I choose a book to read? It’s important to select a text at the right level for guided reading. Start with the child’s independent reading level, or text that they can successfully read and understand on their own. This can be obtained from your child’s teacher (or check the latest report card), and is usually a letter (e.g. Level O). For your guided reading time together, select a text that is one level more difficult than that. Teachers call this a child’s instructional reading level. 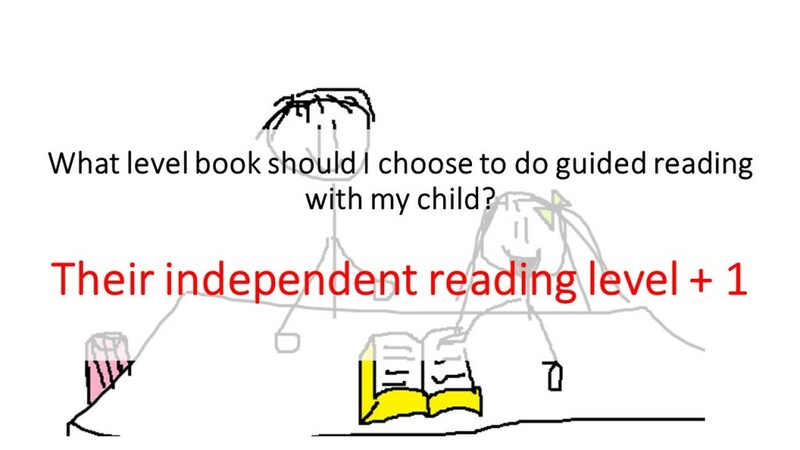 So if your child reads independently at a level O, then select a text at the next level, level P, for guided reading. You don’t want to choose a book they can too easily read and understand on their own (i.e. their independent reading level (or easier)) but you also don’t want a book that is so difficult that you’re pausing every sentence to break it down for them. Also, select a high-quality text that will likely interest your child. (For me, that rules out anything from Captain Underpants or Diary of a Wimpy Kid…) You really want this to be an enjoyable and special time! I oftentimes chose favorite books from my own childhood. Kids can totally sense when you have a genuine enthusiasm for the book and it’s contagious! This will help foster their love of reading and help them look forward to this special reading time together. For some, this is an intuitive process, but for others, especially your struggling readers, this is exactly the kind of metacognition they need to be explicitly taught and coached through to master. The earlier you can begin the process, the better! Even if your child is just a week old, every day is a good opportunity for you to practice your own metacognition skills and your own ability to articulate your thoughts with her. By the time she is in elementary school, you’ll both be pros at thinking about your thinking while reading and sharing that thinking with others! “About Leveled Texts.” Fountas & Pinnell Leveled Book Website. Heinemann, n.d. Web. 07 July 2015. <http://www.fountasandpinnellleveledbooks.com/aboutleveledtexts.aspx#GR>. I’m really curious how you determine whether a kid has that internal dialogue going or not? Or are you just monitoring comprehension like you explain in the next post? I don’t think my mom ever did this with be, but I’ve been a voracious reader since 4. I’ve always just read while tracing the words with my finger. Munchkin is on the Level 1 “I can read” books now, at 5, and he’s (I’d say) mid-level range in terms of either recognizing words or sounding them out. He has a consistent problem with switching bs and ps, which I really don’t think is dyslexia, because when I ask him, he knows what the letters are, but he’s impatient to get through the word. It doesn’t affect his love of books, overall, he sits down with books for hours. Hmm, not sure that most of that is relevant… I’m just curious what you’d say about the internal dialogue! The best way I can get into most of my students’ heads is when I have individual conferences with them and ask them to verbalize their internal dialogue (it takes a lot of practice for them to even start to notice the internal dialogue! ), and also when I have them write reading letters to me to tell me what their thoughts are. My students were usually 4th graders, though! So I’m sure the process is much more basic for a 5 year old. He should be able to voice questions and make predictions at least, but some of the other thoughts might be harder for him to notice and share, like when something doesn’t make sense (and what exactly isn’t making sense). It’ll come with time! I’m very boring when I read to kids also…it’s never too late to learn, right? Love this lesson! Thank you for sharing! Never too late to learn! Plus, I think there is definitely a time and place to just read straight through a book and enjoy the words the way they are, without interrupting with all these questions haha :). Thanks for reading! JoEllen, this post has hit home. I am “that child” who can read perfectly well but can’t remember it after! I used to be an avid reader…would love to read all sorts of stories for a few hours a day but then around middle school I discovered my love of reading turned into loathing. I felt frustrated every time I read and could never remember afterward. It made college that much more difficult! I am embarrassed to admit that I am going to apply your post for ME FIRST and then teach my child! 🙂 As I kept reading your post, asking myself questions about what I was reading made a big difference in what I retained. You are sent from above you wonderful girl you! Thank you for sharing! Love this! I love reading books aloud with my three-year-old and will be excited to learn more about these techniques. Best ever! Love your gifts of knowledge. Will be sharing this with my parents at the beginning of the year. Wish I could translate it into Spanish.